With anglers in Singapore now armed with Madai Jigs and Slow Fall Jigs when they go offshore fishing, it's no wonder the days of the Paternoster Rig (Apollo Rig) and Running Sinker Rigs are numbered. 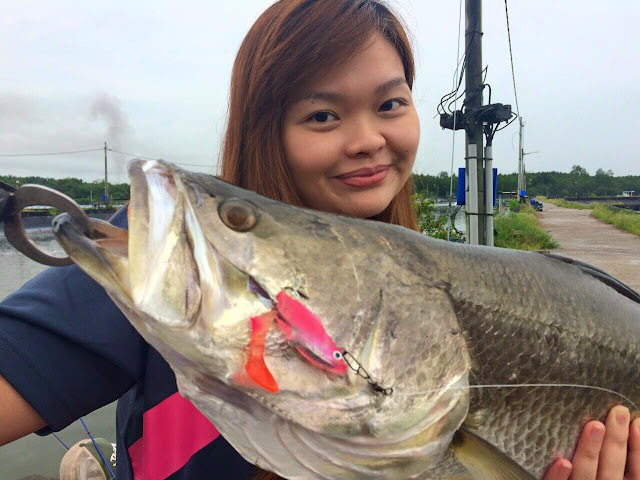 Madai Jigs complemented with live prawns (Maprawns) are very effective and proven in Southern Island or even Changi Offshore fishing. That said, does everyone truly know how to use a Madai Jig with bait? Most newbies will ask what do I do with the Madai Jig and what's the best sure win tactic to get the fish? You'll be surprised at the questions that I get when people ask me how to use it. I get questions like do I cast the Madai Jig! 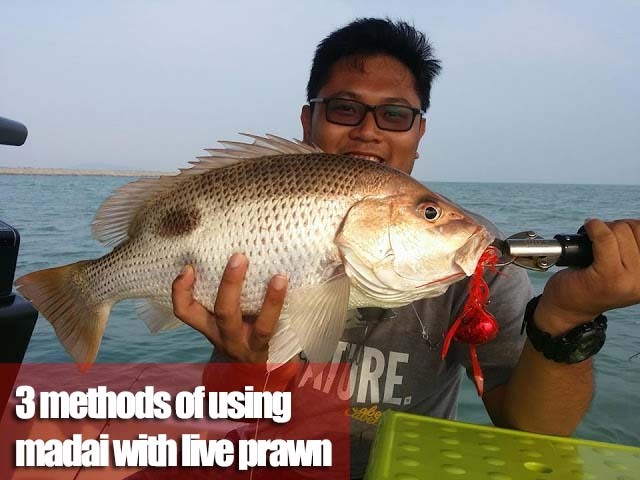 Before you use a Madai Jig without bait, I put together three sure-win or surecatch methods that will definitely make a difference to your offshore fishing if it's your first time using a Madai with bait. Forget about what people tell you about how to hook, how to tie, what rhythm to use or what tactic to use. When drifting, just observe these general rules and you'll get the fish. Although simple, dragging a Madai Jig with bait is not usually recommended because a quick change in terrain will snag your jig very quickly. However, it is a handy tactic to use if you really need your jig to stay close to the bottom or you are tired from all the jigging. It may be useful to alternate between a mixture of bouncing and dragging. Bouncing the Madai Jig up and down as the boat drifts is probably the most common method used by most anglers. The angler keeps track of the terrain using the rod and when uneven or rocky patches are felt, the angler lifts up the jig a few cranks and sends it back to the bottom after the patch is "cleared". I recommend alternating between bouncing and dragging if the bites don't come by purely bouncing. Strangely, some fishes like it when you drag a little and then do a bounce or two. Perhaps the dragging motion makes the Madai Jig seem more like an octopus! 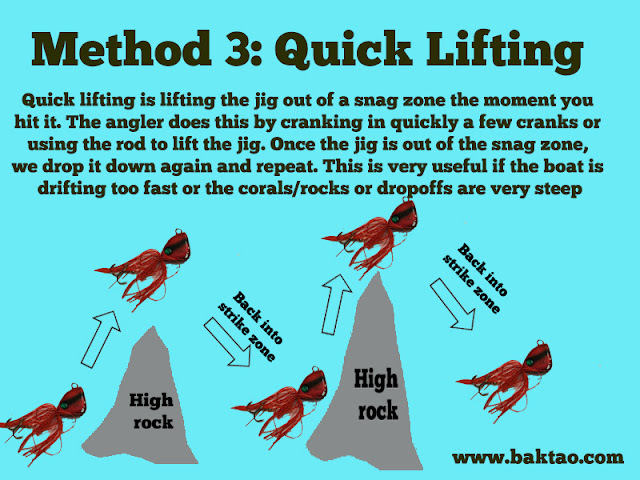 Quick lifting often happens when you are fishing in challenging conditions such as very fast drifting or if the terrain has extremely steep drop-offs or coral. Bouncing and dragging will have high chances of snagging but we still must do something right? 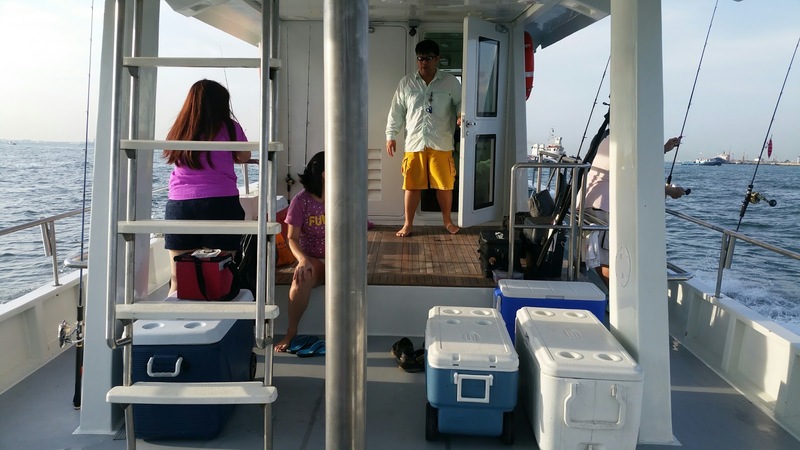 Usually, in order to catch fish, we'll still need to hit the strike zone which is in the midst of all the steep drop-offs and coral. To minimize snagging, we “quick lift” the jig by doing a few cranks or using the rod to quickly lift the jig up from the coral or rock. We repeat this many times until a fish takes the jig. 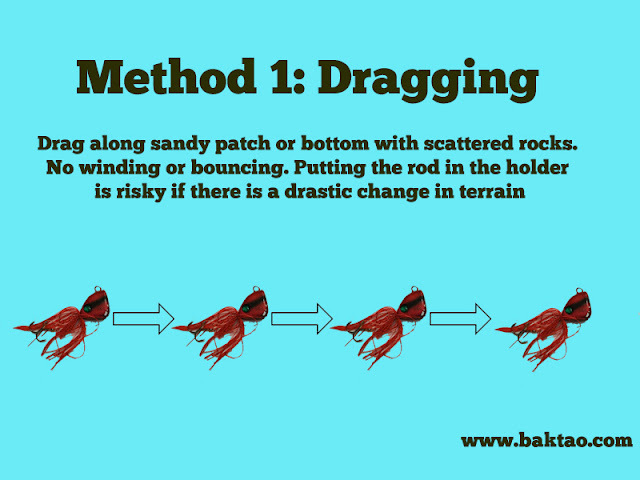 This method will greatly reduce your chances of snagging and while you will still lose some jigs inevitably, it beats dragging your jig into high rocks/coral which will almost instantly lead to a snag! If you have any other methods to share, do share with me and drop me an Email, I'll be happy to share them here as well! 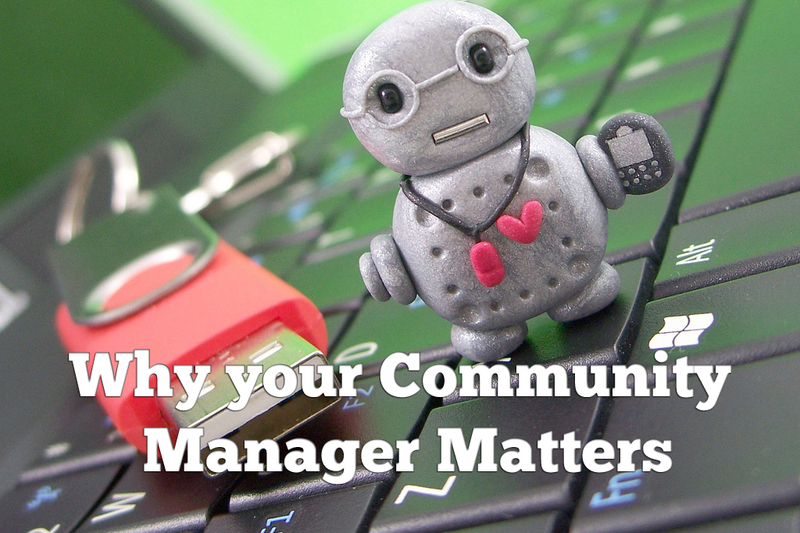 Why your Community Manager matters? It doesn’t matter which industry of work you’re in because you surely have seen the curious job title of “Community Manager” everywhere. While not everyone will eventually be a Community Manager, it’s crucial to understand how this evolving (yes I reckon it is still in its premature stage) role can help businesses. People often tell me, “Hey Nigel, forget about community management because it’s just a title that the big boys that Apple or Google come up with.” Thoughts like that put me to sleep because if you still think like that, you risk being left out of the new world. If you’re like the people above, quit reading this now. The truth is that community management has been existing even before the big boys coined the titles and formal roles. As a teenager that grew up with online gaming, I saw community management everywhere in that industry. The people that ran the IRC chat rooms (to organize multiplayer games), the hot babes that were MMORPG Game Masters and even Blizzard Games experts in the gaming forums – All these people were doing some form of community management. Fast forward to 2015 and community management is permeating every industry there is. Companies and brands are scrambling to hire community management folks, even if only under the guise of “digital marketing”. Although I’m still not entirely sure what a Community Manager (that’s because we probably choose to do everything we like to do) does, below are some points on why you should have one. Don’t laugh when I tell you that a CM can give you high returns because it’s true. CMs can influence in all stages of the consumer buying process and the power of this influence is a subtle, soft one. CMs aren’t going to announce to everyone on what their brand is selling but they’ll just whisper it or just be around your customer when the time is right. A lot of time is spent into whispering into the 1 million cold leads that you company may have. A concrete example of my own job is that I often have students who come to me with excellent referrals. 3) We go for beers and wasted ourselves, we only remember we had fun. 5) Speaker remembers me and connects me with this someone –> BINGO! 7) Wants to do interview with students –> BINGO! This feature of a CM is always detrimental to the morale of the CM. If you’re a CM that works for a company that gets a lot of flak (usually in the service industry), then you’d better have thick skin syndrome because you’re going to need it. I know of CMs in the transport industry who get it all the time from the media, public and even government officials. They basically attend conferences, stand there and very often just say “sorry”. But that’s good news for the brand because once your stakeholders release their emotions on the poor CM, they’re likely to be satiated and when they go home and think about it, they’ll be like “oh man, that poor guy, it’s not entirely his fault and he has a family too bla bla bla…”. Brands get humanized this way and negativity dispels itself. SMRT did a very good campaign by using an aspect of this - they put up pictures of their workers hard at work. So give your CM a pat on the day, any day. He or she deserves it. As mentioned earlier, a CM’s exponential connections mean a CM can be highly effective throughout the digital marketing chain. Whether it is subtly injecting informal hints (to the community) about a product launch to boost organic reach or simply “roughly” knowing what consumers want to hear about, your CM is your instant “focus group” in insane mode. When you have a CM who is competent, milk him or her for his insights and views and try to formalize/back this up so your CM’s hunches are well targeted. Make your CM do A/B testing with communities and do formal, subtle experiments. You’ll never turn to agencies to do focus groups again. Odd hours are no problem for CMs – all the good work involving human interactions are done away from office hours anyway. The late night beer drinking, partying with communities never happen in the day time. Your CM is highly likely to be 24/7 on Twitter or Facebook just being the ultimate social junkie that you ever have. He or she will do the odd things like skip lunch (and attend a talk related his or her community) and more. Don’t ever box in the CM to “office hours”. You’ll likely be stripping him or her of their powers. Being everywhere around the community also means your CM understands the intricacies of rival brands and it’s also probably because rival communities overlap all the time. This is why your CM is the ultimate guru in strategic planning. I worked for a brand at an IT fair once and CMs were everywhere – they were doing checks on live retail prices, checking out on the models and really just eyeballing 24/7 or even interacting with rival brand’s customers. I personally remembered a CM of an IT brand checking up on our prices and literally running back to his sales booth to print out an updated price list (because he saw that ours was better). After the new price was up, he mobilized his sales army to get this information out to the public. Imagine the amount of damage a CM can do to your rivals. CMs are also all about favours which is not going to happen if you don’t know enough people in the community. I get a lot of requests from my colleagues on who to ask, who to pick and I’m still proud to say that I almost always know. The common requests are like, “Nigel, can you find someone to interview this Prof… I need someone who is well versed in this topic”. And then I go like sure no problem, I’ll call Jane (not a real name) to be there tomorrow at 2.30pm. Jane then turns up at 2.30pm the next day, we wrap up the shoot and go for beers after that (which the CM always pays). If your company has no CM, maybe you’ll be finding that someone for tomorrow with a mass Email which would probably fail miserably. Favours are priceless and a surviving human aspect in our increasingly digital landscape. Do a favour now, get yourself a CM if you haven't had. Nigel is a Marketing Communications Executive at the Lee Kuan Yew School of Public Policy. While he is not a qualified academic, he is an environment enthusiast with a particular interest in sustainable fishing, urban farming and climate issues. He has been featured in the media for a few fishing related cover stories and articles. 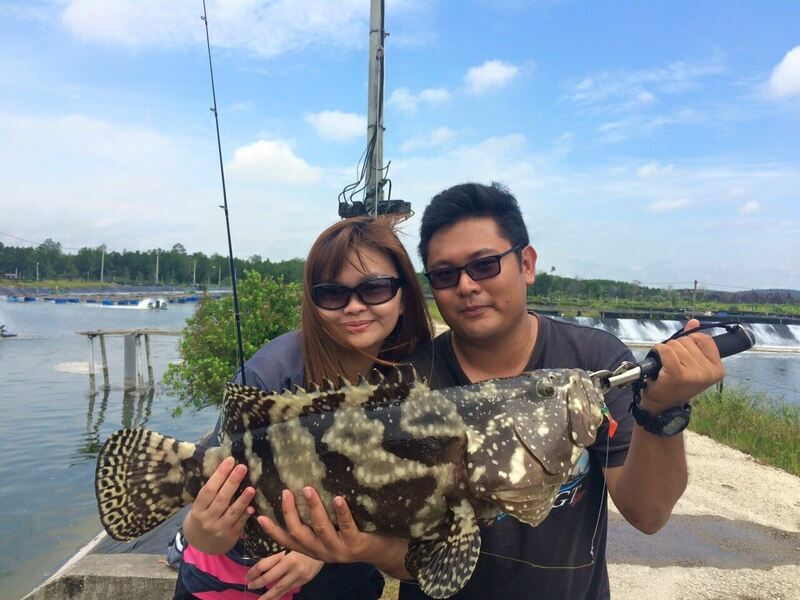 It's not always that we have both comfort and good fishing on fishing charters in Singapore. 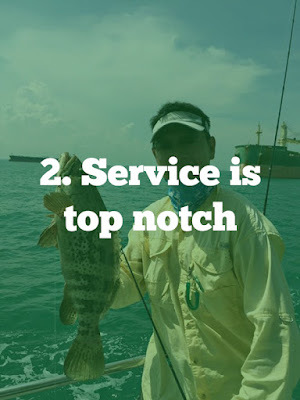 When the fishing is good, it's likely that the fishing captain is not really the cleanest guy around or service may not be the best (since he/she let's the fishing do the talking). That brings me to fishing with Joe Chan and I wasn't disappointed. 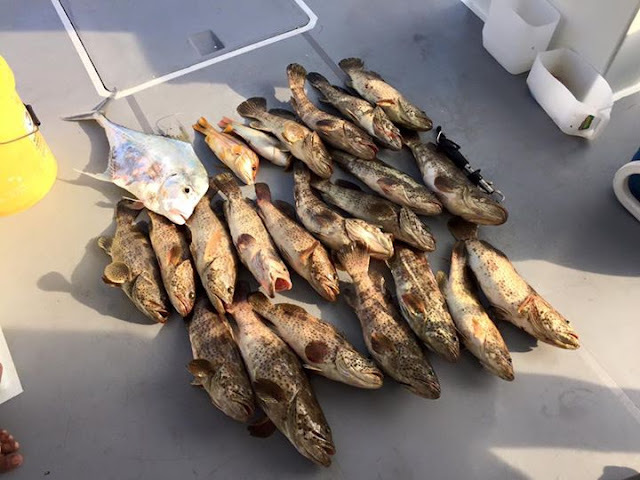 Fishermen are often skeptical of "comfortable" fishing charters since most productive boatmen are old timers and they don't really own luxurious boats. Joe Chan shatters all of this with his huge boat equipped with air con cabin and even a sun deck. The first trip with Joe Chan to Southern Islands was a real treat and it shook me so much that I am writing about him! 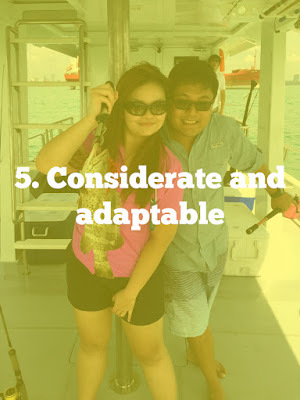 Below are five points that you can consider if you are taking his boat. Air con cabin with two deckies & still affordable? 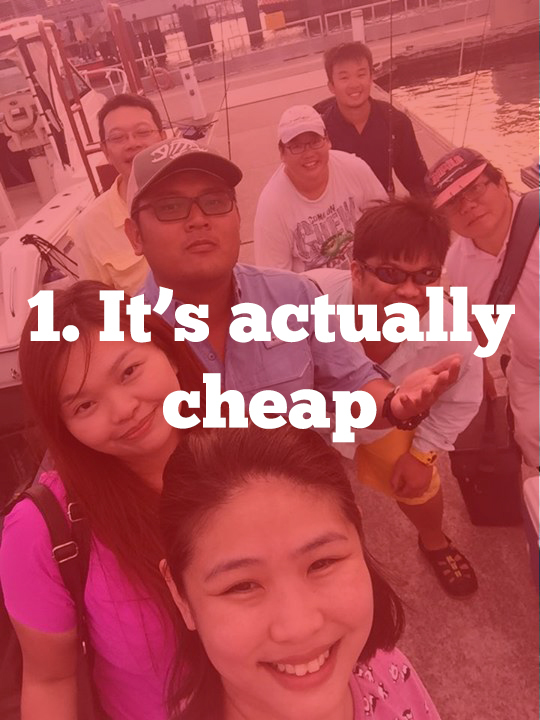 Joe Chan's boat can take 10 anglers comfortable and his boat costs only about $800-$1000 to charter based on how much prawns you order. That's about only $100/pax which is the price most anglers are paying these days to fish on smaller boats. Service is the best I have ever had simply because Joe Chanh ad two deckies. While this is common for long haul or regional live on board trips to places like Eastern Banks, Joe Chan is probably the only charter that offers two deckies for your local day trip. Deckies help in a variety of ways like clearing snags and they are very useful if you are bringing beginners. This makes Joe Chan an excellent candidate for a corporate fishing trip. Oh, did I mention that he has like 4 bait wells places in strategic corners of the boat? Air-con in the toilet. Need I say more? Bringing their wives and girlfriends (WAGS) fishing is a tricky problem that many anglers face. While not discriminating against the women, fishing boats have to be well equipped with basic facilities such as toilets. 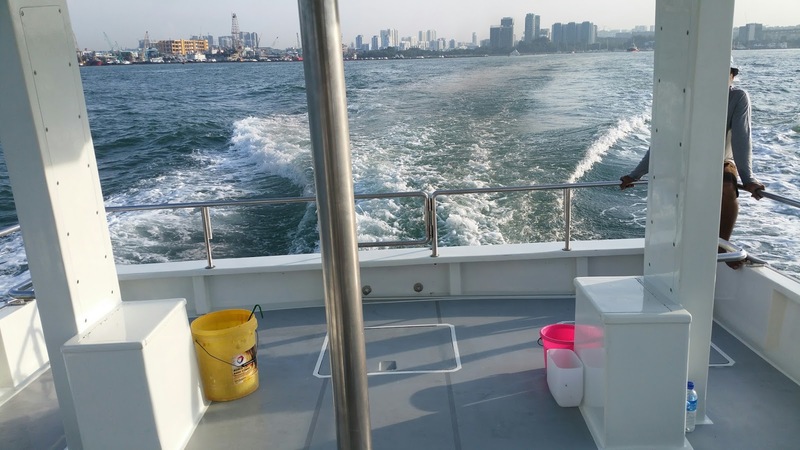 Joe Chan's boat is equipped with a toilet (with shower), air con cabin and spacious fishing spaces. 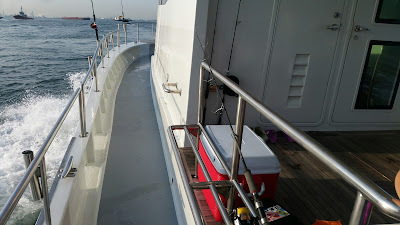 The boat even has strategic places where you can "lean" to when you're fishing. One of the common questions that jig anglers will want to know is whether a particular boatman or charter captain has experience of fishing with artificial lures. This can affect the bite rate for the day as fishing with artificial baits is something that comes with experience. It takes a massive amount of experience to gauge the current & spot on whether it is suitable to fish. I've encountered many charter captains who simply park or drift at the spot and say can use jigs. Remember, truly experienced captains will tell you when to jig and what you are expecting. Instructions can be very detailed and might even consist of tips like using certain colours & techniques. Most of the time, the best advice is 'don't jig now, it's no use'. Fishing isn't just jigging, madai, luring or bottom fishing. In the true world of offshore fishing in Singapore, various kakis of different fishing styles come to your boat. Though it is true that most anglers come well equipped now, how do boatmen (who regularly bring well equipped folks out) adapt to that "fishing uncle" or "newbie" that turns up with a pond fishing setup and frayed mono line? That's where Joe Chan scores well. On my first time with Joe Chan, he told us that current was too strong for our setups and went to somewhere with mild current. That was impressive because he adapted to his customers. Very often, we encounter boatmen who simply just drive to the spot anyway and when the customer loses the fish, the boatman will just say because your tackle cannot make it. Familiar? Now, the second time I tested this theory was when a friend of mine booked Joe Chan for a corporate fishing trip. 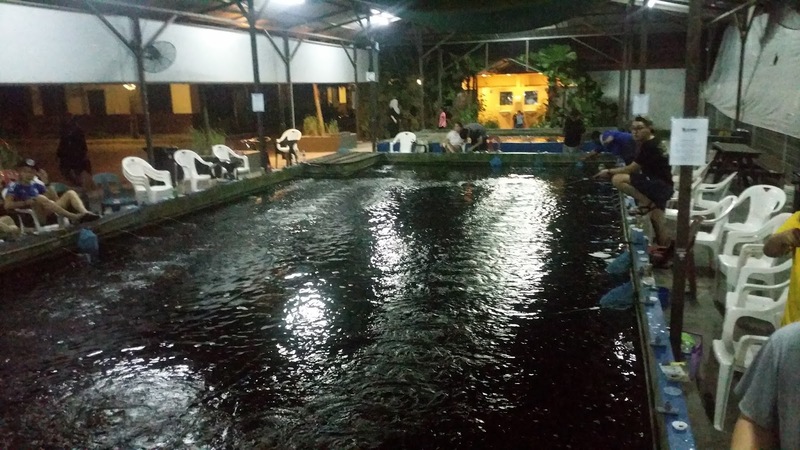 Same scenario here - how do you ensure a group of newbies on a company fishing trip catch fish? The standard request would be small sinkers, easy spots please. Joe Chan handled this well and the newbies caught some good fish on that particular trip. In essence, a boatman cannot simply be good at finding good fishing spots, he/she must be considerate to factor in what your audience can do or cannot do. This is much easier said than done as you have to integrate this mindset into the fishing spots and expectations. All in all, I would seriously recommend Joe Chan if you're looking for a fishing trip out to the Southern Islands! See the two square containers? Those are live wells! Singapore Red Cross Family Fishing Fundraiser "Fish For Food"
Hey folks, check out my Facebook page on how you can take part in a special social media contest to win a single entry ticket to the upcoming Singapore Red Cross Family Fishing Fundraiserat D'Best Fishing Pond also known as Pasir Ris Main Fishing Pond. The Dragon Tiger Group - Not too bad a fight for my custom St Croix 8-14lbs! 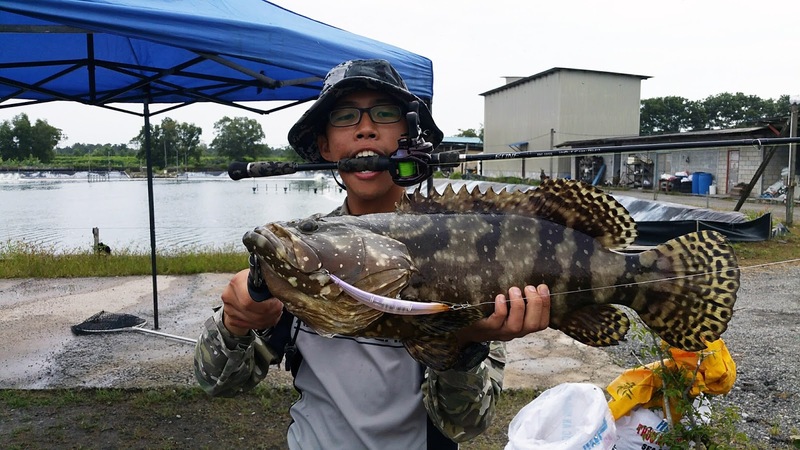 As wild fish stocks in Singapore and the rest of the world start to decline, paying money to fish in a stocked artificial pond will be lucrative business. 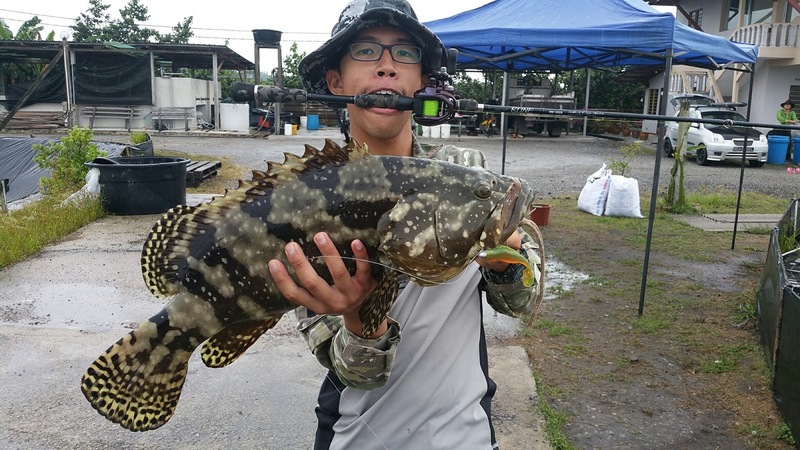 We've seen "catch and keep" payponds in Singapore do well but recently more ponds are using the "catch and release" model. This model sees more ponds stocked with huge Tiger Groups and Dragon Tiger Groupers which are popular among our local Singapore anglers. Various ponds locally and regionally are now stocking these fish. 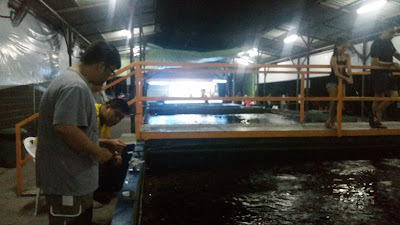 We even have a new "catch and release" fishing pond in Batam, Barelang. While I do not usually fish at pay ponds, I can't deny that such ponds give newbies or beginners a good first experience. Such ponds are usually high on bite rate and well stocked so newbies won't have the problem of "fish not biting". This was exactly what happened when I brought first time budding fisher-woman Bakgirl out on a trip to Desaru "Brother" catch and release pond. Bakgirl instantly felt what it meant to hook onto a double digit grouper and all this was done by using artificial lures! Monster Barramundis were also landed on rubber lures and really gave our tackle a run for their money. Other kakis that used hard bodied lures such as the bent minnows and poppers were rewarded too as everyone's tackle "screamed". See our happy faces below? Fishing in Singapore payponds will never be the same again! 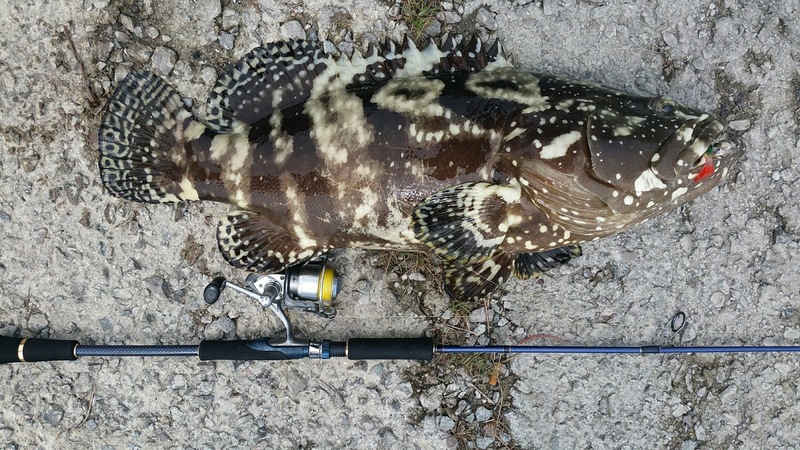 Team effort to haul up this grouper! Well, she did it too! Cast and bam! 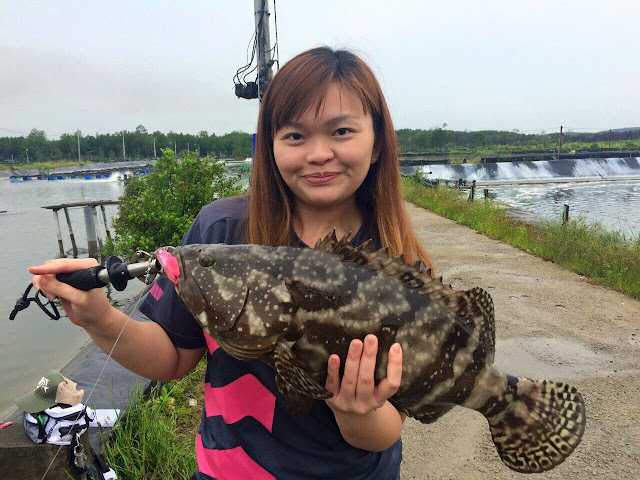 Small groupers also loved the pink rubber! I couldn't help but have fun some too! OSP bent minnow tempting this fella! Desaru "Brother" pond is highly recommended and is really quite affordable. Between the two of us (usually one rod only as Bakgirl was a newbie), we landed easily more than two dozen fishes of good size (average 4 - 10kg). The fishes there are also relatively healthy since the pond's fishes are the "pets" of the owner. They're well fed and fight really well compared to other similar payponds. 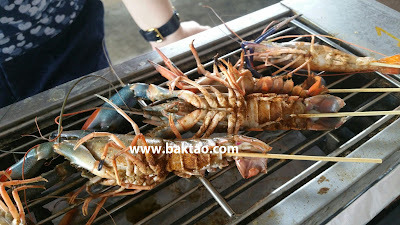 Prawning catches in Singapore have been on the slide since this hobby got popular. Prawn ponds these days stock up more small prawns and don't release as much prawns as before. All is not lost though and to my surprise, this humble small pond at D Kranji Farm Resort are stocking up big blue mountain prawns and are very generous in releasing prawns. The management of the pond were very friendly and serves you with a smile. Another interesting feature of the pond is that it also provides curry powder as a seasoning and the MSG made the prawns more flavorful as we grilled them! The tagged prawn system is very logical and down to earth. 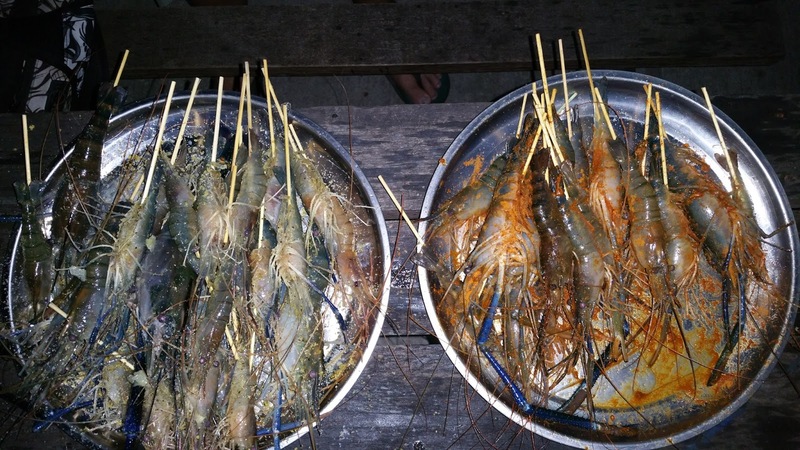 Simply get cash when you catch tagged prawns. 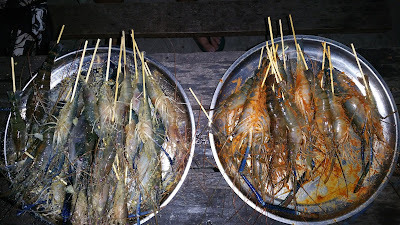 This is good as it is not the usual get free hours when you catch tagged prawns scheme. Nothing like instant cash back right? Parking is quite ample and although the location is very "ulu", it is quite "modern" inside with a restaurant beside the pond. The pond sells some basic soft drinks and no food & beer (yet). Bring mosquito repellent and a portable fan if you have. I reckon that you have to go visit this pond as soon as you can. It's a new pond and the crowd is still a little lukewarm. The water is also clean and there is no lingering "medicine" smell that many other prawning ponds have. Although I've said many nice things about this prawning pond, only time will tell if it goes down the usual way of other ponds. Let's hope it doesn't! Baktao and friends go on a pure Tenya fishing trip on Fishing on IT'S Gr-R-Reat. So is Tenya effective? You bet it is! Hear from Jimmy as he shares with us how to do it right in Singapore waters. 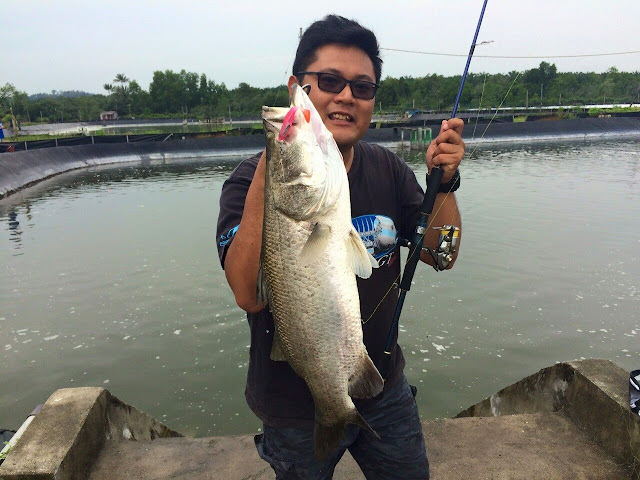 Tenya fishing is a less tiring way of fishing compared to using Madai jigs. Jimmy compared it to the traditional way of fishing using HK hooks. 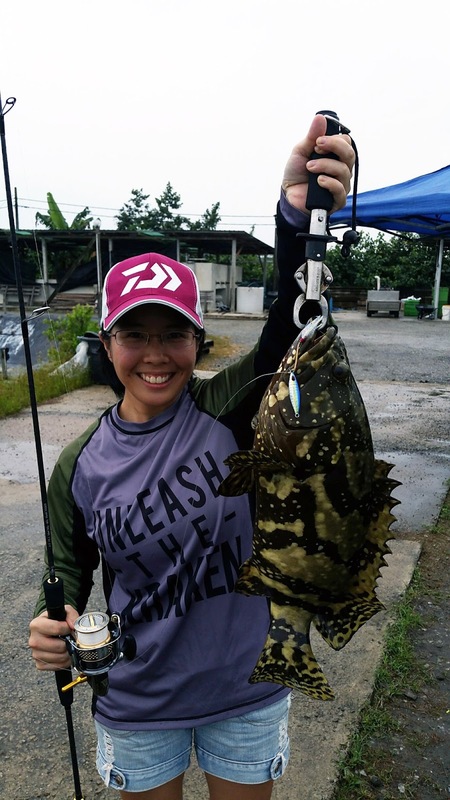 Catch the video as he teaches you how to hook the prawn for a tenya, what tackle is suitable for Tenya and shows you his various types of Tenya such as the Shimano cupcake Engetsu. 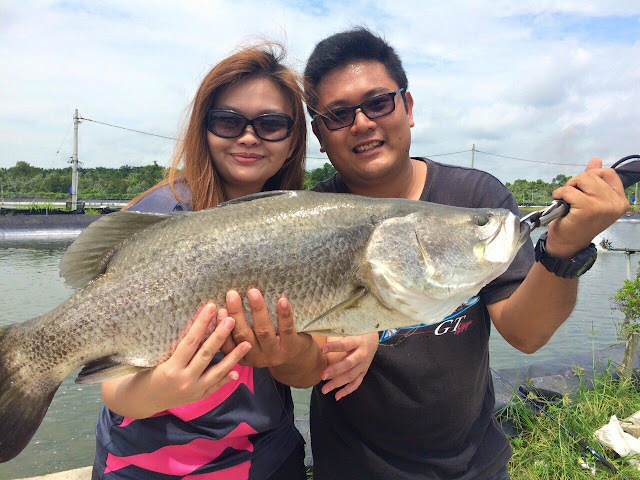 A good day out fishing at the waters near Pulau Ubin, Pulau Tekong and Changi! Tenya has now picked up popularity in Singapore and is one of the most effective methods of doing offshore fishing in Singapore. I've currently brought in a batch on Red Tenya 60g which you can get from me here. There are many benefits to drinking coconut water but it is only recently that the Singapore market has been flooded with these refreshing drinks. 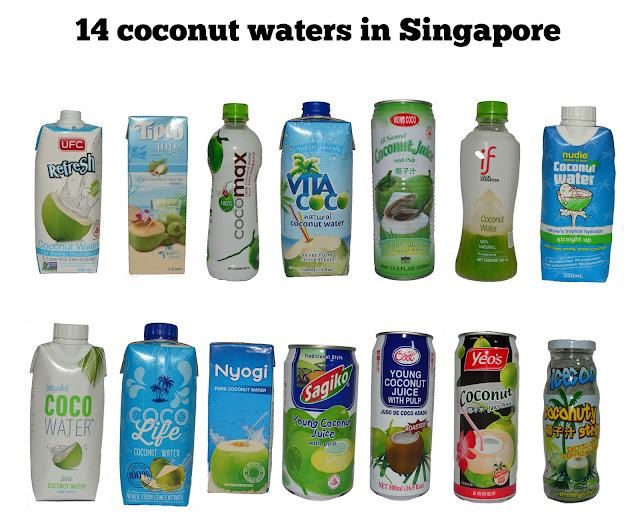 If you look closely, you can find more than 15 brands of coconut water in our supermarkets. This could be due to drink manufacturers finally adapting to Singapore consumer’s healthier choices. These days, modern day coconut water such as UFC Refresh is also proven to contain less sugar than conventional canned coconut water and also available in large tetrapaks. Check out this site on the criteria on how to choose the healthiest coconut waters. The fact that they are packaged in tetrapaks actually reminds me of buying milk and very soon it gets into my head that whenever I grab some milk, I should grab coconut water too! While coconut water is usually drunk as a beverage while eating out, you should also start to consider bringing coconut water on your fishing trips because of various beneficial reasons. Firstly, coconut water is refreshing and helps to replenish lost electrolytes. It also hydrates your body of the lost water when you’re fishing under the hot sun. If you’re having a bout of seasick, down coconut water to instantly re-balance your bodily fluids. Secondly, drinking coconut water can lead to better skin as studies have shown that it moisturizes the skin if ingested orally. In fact, coconut water is used in a large variety of facial creams, skin conditioners and lotions. The next time you suffer from sunburn during a day of fishing, try drinking some coconut water and observe its curing effects. Thirdly, everyone loves the refreshing taste of coconut water. It’s a simple drink that you can bring along to replace sugary soft drinks like coke. So which coconut water did I find best for fishing? I scouted around for almost all the available coconut water found in Singapore and came up with the below nutritional list. I found that I personally preferred less sour coconut water which is a little sweet (but not too sweet) and the coconut water should have a nutty flavor. The coconut water should also taste "pure" and although this criteria is hard to actually measure, some coconut water do taste less "pure" than others. It is an interesting statistic that Coco Life and Vita Coco coconut waters are both made in Malaysia and have a much higher sodium content than all the other coconut waters. Perhaps this is a feature of Malaysian coconuts? 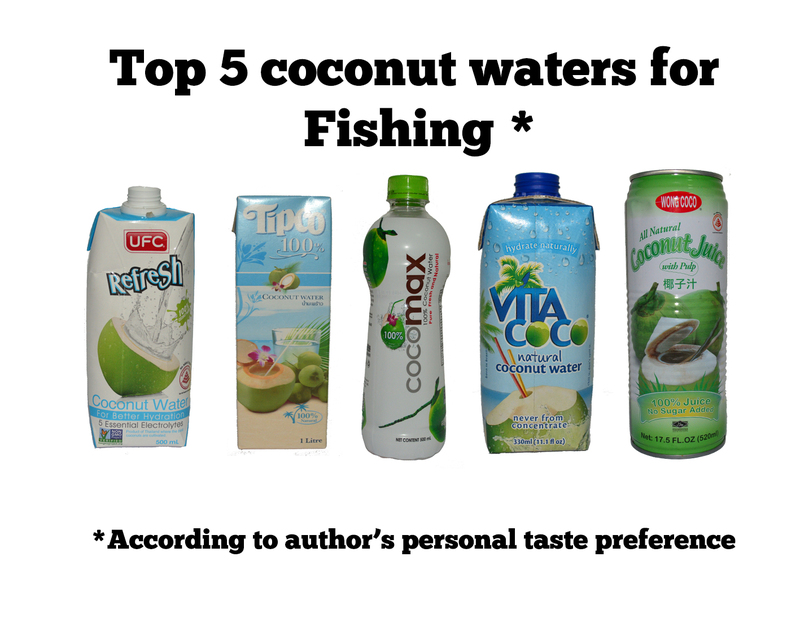 I reckon the below 5 coconut waters are the top ones to bring along to your fishing trip. UFC Refresh is the best choice for me while Tipco comes in second. Cocomax is easily available and very high on the nutrient side. Vita Coco made it to the top 5 but as it generally tasted great. Wong Coco's can coconut juice surprised me by being quite refreshing and pure. It also has coconut pulp!That's all folks. Happy drinking coconut water while fishing! It's #GE2015 and surely the Baktao has something to say about it? Thankfully though, I won't be politicizing my page in a nonsensical way. This post will link back to fishing in a fun way and hopefully not be too biased to any political party. Since ESM Goh likened PAP to a cruise ship and LTK thought it was the Titanic, Baktao would like to think that the Government is a fishing charter operation in Singapore which is driven by 89 boatmen. 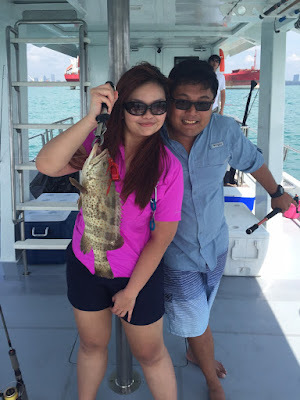 Why fishing charter? I believe that the Government is responsible for creating a productive environment in which our people can possibly catch the biggest fish of their lives, whether to feed their family or to keep as trophies. Below are my fishy views on #GE2015 so far. The views are individual points that stand out to me and are in no way written to relate or link to each other. Our world was never stable and is facing increasing instability in this generation. Economies have evolved and countries have learned. Singapore is vulnerable to external shows of force, accidents or rebounds. 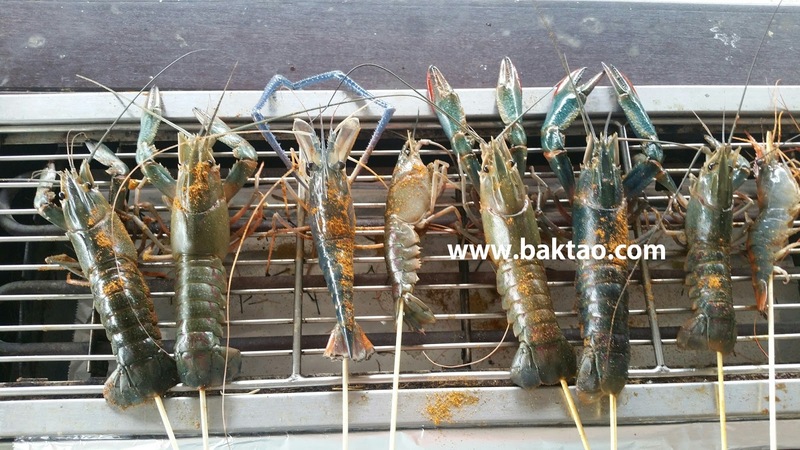 In the fishing charter business, that is true as well. Charter captains are subject to the elements such as weather, like algae bloom and even man-made disasters such as oil spills from ships. All these can lead to an extremely bad catch and are scenarios that a charter captain will have to plan for. Such externalities are already showing itself in issues like the China stock market crisis, haze and territorial disputes. The question here is that our incumbent Government has the track record in steering its fishing charters skilfully to navigate these issues which appeared over the last 50 years. While they have not done an entirely perfect job in the micro aspects of many policies and initiatives, there is no doubt that most of us have an abundance of fish on our table. Many of us in generation X & Y are reaping the rich harvests of our parents (PG). Now before you think I am biased towards the Opposition, read my next point. 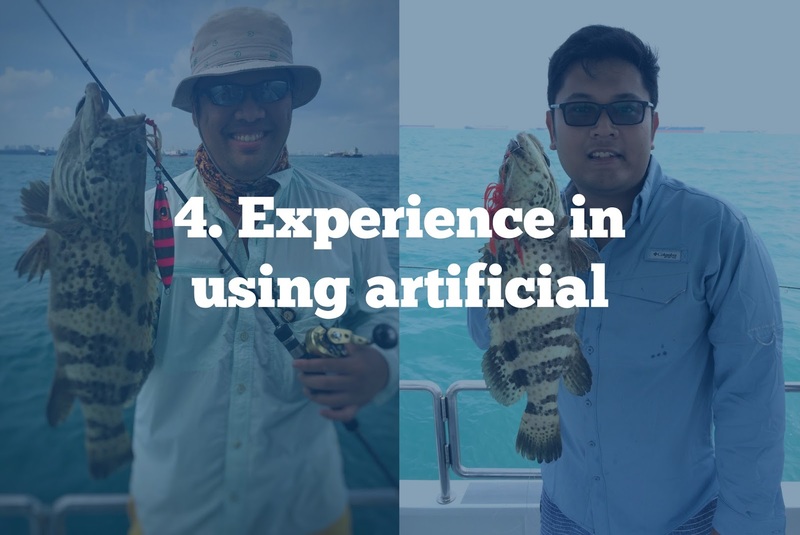 Now that I have labelled our Government a proven fishing charter, most anglers will be thinking the question of "Are you sure there aren't more qualified charter captains in Singapore?” My answer is of course there are but are they proven? 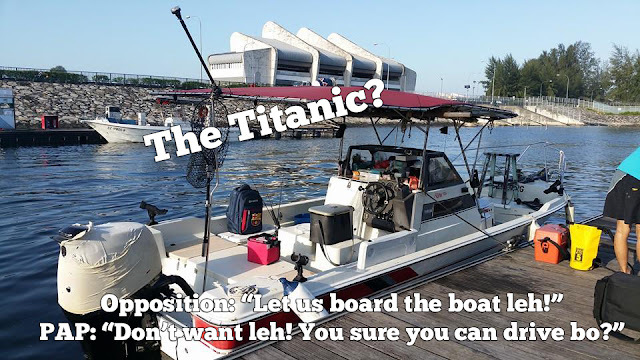 While it's true that some Opposition charter captains like Lina Chiam have been there and done that for some years now, many do not have this experience. There are also many Opposition charter captains like Prof. Tambyah who have worked in the Government or Quasi Government. When are we going to give them a chance to appreciate how difficult it is to bring people out fishing and guarantee a good catch? In other words, when will we be seeing an Opposition taking up a Ministerial portfolio and really walking the talk? Looking at some of the Opposition charter captains these days, I think that the day will come soon as make no mistake, quality has generally inched up a little although it still "feels like" the Opposition of old. Until the Government gives some credible (if any) Opposition a chance to board the boat, the Opposition will just continue to be doing what it's doing which is shouting carrots at the docks. Another one of the problems that I feel exists in the Opposition camps is the stability of the Opposition. While I understand that the Opposition has less resources and less drive to continue being the Opposition, you have to doubt whether they will sustain. When SDP first contested my constituency in 2011, they had Tan Jee Say on their side but now he has moved on to another party. Also, the entire SDP team which contested in 2011 has been dissolved. One could point to Lina Chiam and team holding their own at Potong Pasir for many years and I salute that. Then again, who can deny the troubles in the NSP? Who can forget the CST & CSJ episodes? Who can forget the miscommunication in the WP when they said they would only reveal candidates during nomination day but then did so the next day? Who would be able to forget that LTK said he won’t discuss any more on TC but the next day brought it up again? Such lack of stability and unison is evident in the Opposition even if MSM blew it up. I, on the other hand witnessed the incumbent Government candidates executing a flawless build up to the Elections and a sound leadership renewal plan. I have also came to the conclusion that Singaporeans only want perfection and everyone is a perfect example of that. Whether we source for food, clothes, holidays and so on, Singaporeans are generally ‘Kiasu’ and we cannot settle for less. When you have Singaporeans wedged in various classes in society, you end up with a lot of expectations that Government policies will never satisfy. Policies will never ever satisfy everyone or anyone. The same goes for the variety of fishes caught during a fishing trip on a fishing charter. Some of us want groupers, some want snappers and yet some simply want tamban. The Government has always been emphasizing that policies will be rolled out to those who have yet to get their tamban (low income) or have already caught many fish in their life (PG). Yet, some of us who already have our Groupers & Snappers, want Red Groupers! I have noticed this in some of the most fervent Opposition supporters. They already have fish but yet they continue to make noise that some people don’t have tamban. One wonders though, how would they feel if the Government took their 1 snapper and transformed it into 10 tambans (increase taxes to fund social welfare) so that it could be shared among those who don’t have fish. I work in a Public Policy School so I know when I say plans have already been there. 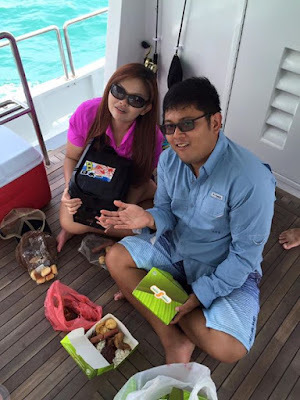 When Singaporeans are busy eating all the fish they have caught, we easily forget that plans are already being made for our future fishing trips. Many of us fail to notice that many policies that the Opposition call out for are already implemented or exist in one form of another. The most common one is the minimum wage in which our Government has rolled out a progressive wage scheme for the lower income. How about the Land Transport Authority Master Plans which have planned for a larger transport infrastructure since donkey years ago? How about the population white paper which is actually a projection based on what Singapore could be like in the future? How does it relate to fishing charters? I would imagine that the Government would be checking the tide tables and wind strengths a few years in advance to determine a good catch! Are we voting for quality of candidates or just because we want more alternative voices? The stand out point for me and the point that most are pondering this #GE2015 is whether we want to vote with our hearts or brains. If you vote with your heart, it means you just want more Opposition in parliament, no matter the quality of the Opposition. If you vote with your brain, it means you just want to vote the best candidate in, regardless of political party. 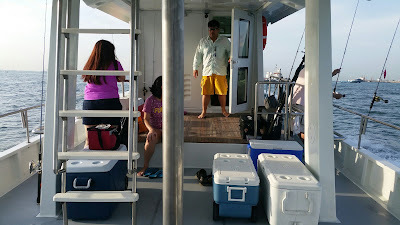 In fishing charters, heart means you want to vote in a charter captain which works hard but may not bring in the fishes at the end of the day. Brain means, you vote in a captain which definitely brings in the fish no matter what. Personally, I’ll be voting with a combination with bias towards the brain… The closest bet for me seems to be Lina Chiam from SPP but sadly I don’t vote in Potong Pasir anymore. As a young adult, I cannot afford to gamble with my future and I’ll rather supress Opposition voices for a few years more until I can afford fishless trips. 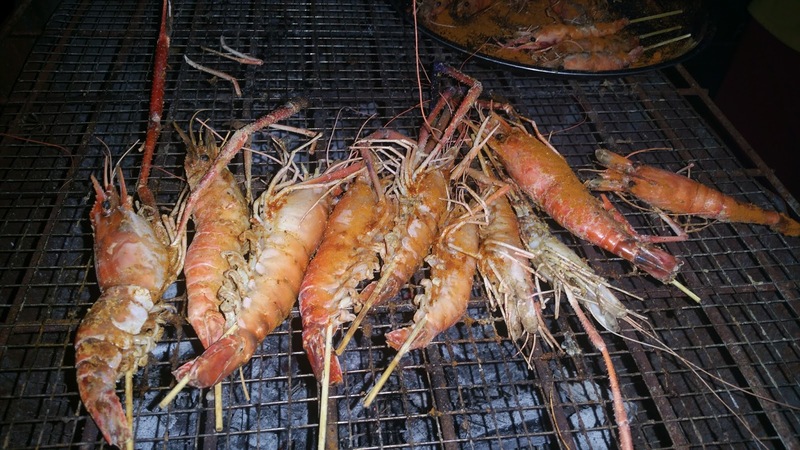 "It just isn't productive anymore"
I came from an era where prawning produces very large prawns and each person would get around 30-50 prawns for every 3 hours of prawning even though they may be beginners at prawning. The prawning costs are usually 3hrs - $30 and it was a whole lot of fun. After some sporadic prawning trips to Jurong Haibin and Orto, Bottle Tree Park, I somehow feel that prawning isn't productive anymore and the trend seems to be dying off. So if you were into prawning last time and going to visit a prawning pond soon, do lower your expectations. Orto at Bottle Tree Park came across as a very experienced prawning operations setup in the ever popular Bottle Tree Park at Khatib. Bottle Tree Park is also where Fishing Paradise is operating. At first glance, you could see space maximization, efficient operation setup and impressive use of technology to ease operations. Rods were tagged using bar codes, there was NETs available and even fixed prawn release timings. I was quite impressed by the whole setup. Orto had a "members" package at 10hrs for $108 and it was a no brainer to take that package since you can divide the 10hrs into many rods if you're going with a friend. 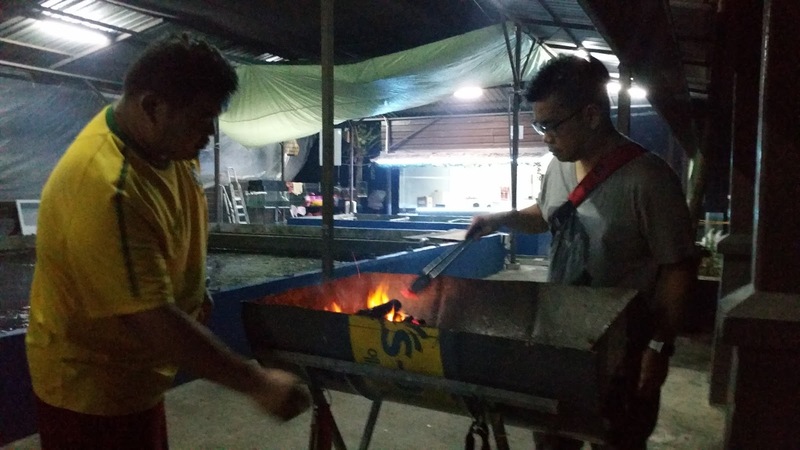 Orto prawning pond also featured electric grills so no messy charcoal was needed if you wanted to grill your prawns. Neat! 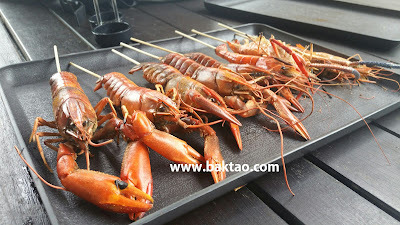 Prawning for the usual prawns got very boring but Orto had freshwater Yabbies in some ponds designated as "Yabby Ponds". Yabbies are tougher to catch as they have very tough shells to pierce and they are also heavier in weight. 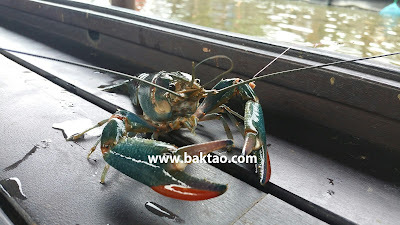 Once you hook onto a yabby, you'll have to fight it very carefully. 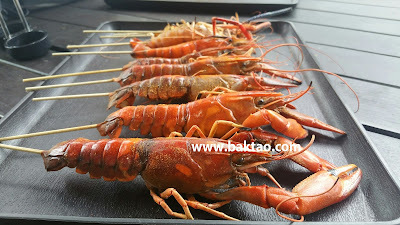 Yabby claws are also much more lethal than prawns so handle them carefully. 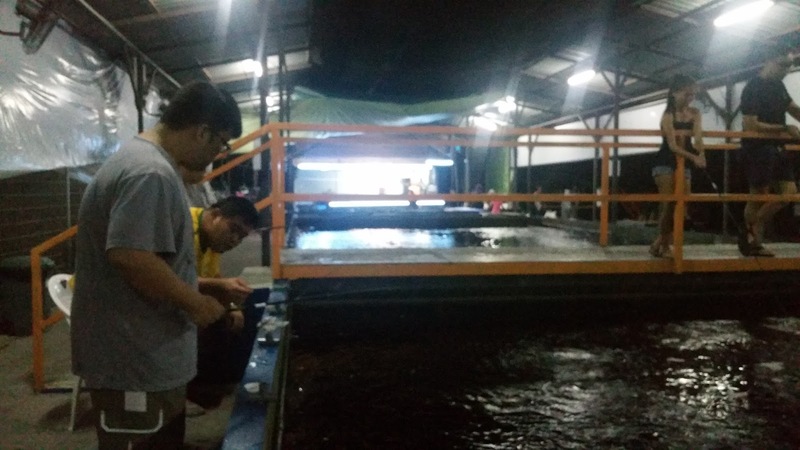 I somehow find Yabby ponds very good for teaching newbies the basics... 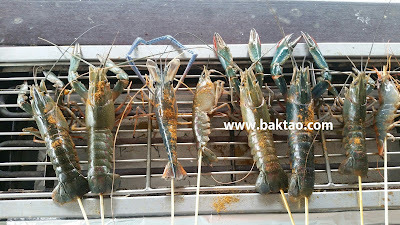 This is because Yabbies are heavier and when they get on the bait, it is extremely obvious. They also grab the bait better and don't let go often. You can then teach newbies how to set the hook firmly. 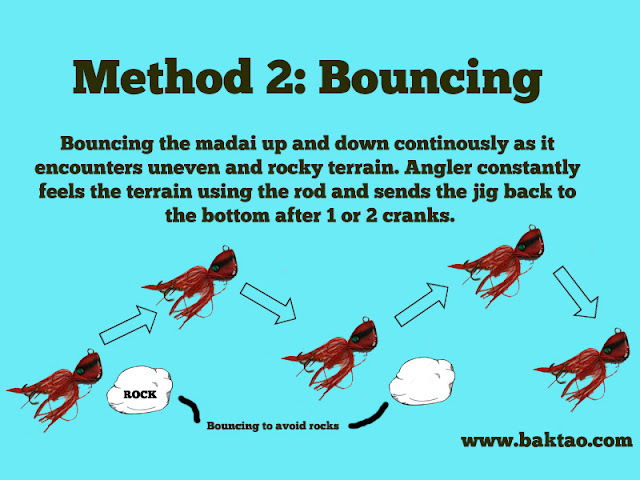 You'll need to strike hard for Yabbies for the hooks to go in deep but after you get the hang of it, it's very easy. Looks very tasty and it is! Oh yes, Yabbies are also more tasty then the usual freshwater prawns and I highly recommend a blend of Cajun spices to accompany your prawns!